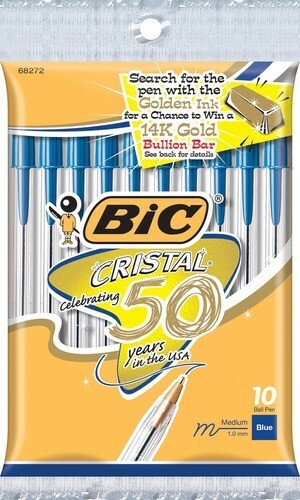 Get FREE Pack of BIC Cristal Pens at Target with Coupon. Grab this new printable coupon for $1.00 off any BIC Stationary product then head to your local Target store for a killer free deal. They have the 10 count packs of BIC Cristal pens priced at $1.00 so with this coupon they'll be totally FREE. The BIC Cristal ball pen was first introduced to the American consumer in 1959 and cost 19 cents a pen. Despite an inflation rate of 622% since that time, the price of the pen has never changed. The Cristal ball pen has been a best seller from the very beginning. Today, US retailers sell approximately 400,000 BIC Cristal ball pens everyday—146,000,000 a year!